Fall ushers in the football season and new advertising opportunities. Over 800 brands aired spots during college football games in September. 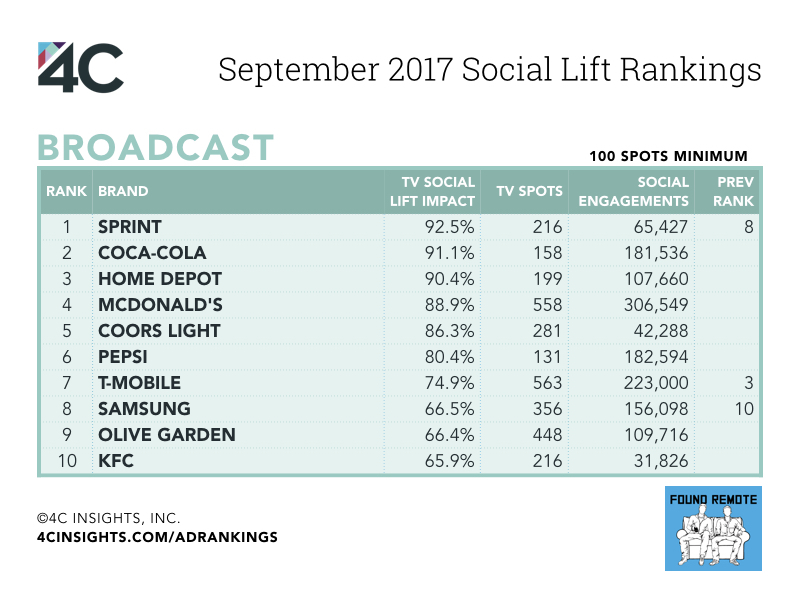 Coca-Cola achieved a 121% increase in social engagement from its spots on college football helping it achieve the 2nd spot in the September TV Social Lift Rankings on broadcast. Read more below on what drove successful TV campaigns in September. Sprint claimed the top spot in the broadcast rankings with its TV spots increasing social engagement for the brand by 93%. People were most interested in phone deals from Sprint. Ads featuring phone deals across Motorola, Essential, and Samsung were responsible for the greatest lift in social engagement. Coca-Cola’s food feud campaign earned the beverage maker the 2nd spot in the September broadcast rankings. Ads airing during PGA Golf, College Football, and NFL Football were the most effective at driving social engagement. PSL Season has returned and propelled Starbucks to the top of the cable rankings. 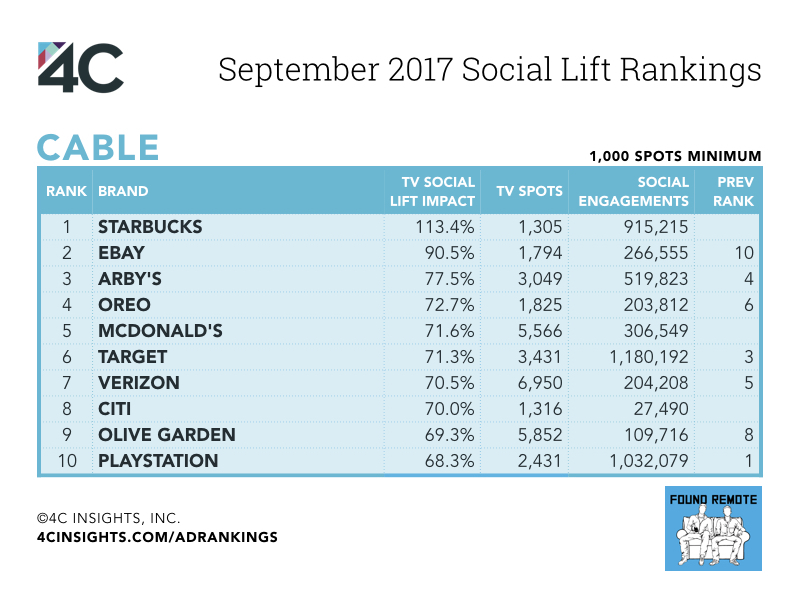 In September, Starbucks’ cable TV spots doubled its rate of social engagement. eBay’s fashion-themed ad was well timed with New York Fashion Week driving a 91% lift in social engagement for eBay. For example, Sprint’s 92.5% TV Social Lift Impact means Sprint’s broadcast TV ads increased Sprint social engagements by 92.5% in the two minutes following the start of an ad. 4C is a global leader in data science and media technology with solutions for multi-screen marketing. Brands, agencies, and media owners rely on the 4C Insights Affinity Graph™ to identify their most valuable audiences and improve effectiveness across channels. With more than $1 billion in annualized media spend running through its software-as-a-service platform, 4C offers activation on Facebook, Twitter, LinkedIn, Pinterest, Instagram, and Snapchat as well as TV Synced Ads across display, search, social, and video. The company also provides paid, earned, and owned media analytics leveraging its Teletrax™ television monitoring network which detects over 400 million TV asset airings on an annual basis. Founded in 2011 and based in Chicago, 4C has staff in 16 worldwide locations across the United States, United Kingdom, the Netherlands, France, Hong Kong, India, Singapore, and the Philippines. Visit www.4Cinsights.com for more information.